There's a mountain of information that comes out following the end of the year in comics — and more yet to come, as we await the 2016 final report from Diamond Comic Distributors. After last Friday's report on December comics, there's one more category we can report on: the average price retailers paid for comics appearing in the Top 300s each month. Looking at all 3,600 items and dividing by the number of copies ordered gives us a weighted average of a fraction over $3.85, down 11 cents from 2015. Below and on our updated yearly sales data page, you can also see something we've not seen in a few years: the average comic book offered was actually more expensive than the average one retailers bought, at $3.89. This hasn't happened since 2011, when DC reduced the prices of its line from $3.99 to $2.99 the first time — and is the direct result of its doing so again in 2016. It's interesting to note why some of the other previous gaps between the two statistics happened. For the column on the right to be the lower-priced one, the more popular books need to cost less, and there needs to be a lot of them. In late 1990s, Marvel's titles were generally cheaper than the average title offered — but in that bankruptcy era Marvel had cut back the number of titles it offered dramatically, allowing many higher-priced independent titles onto the Top 300 charts every month. Near-parity with weighted prices was achieved in the late 2000s, as the more popular publishers increased their prices along with the sizes of their lines, making the average book retailers purchased likely to be a more expensive one. 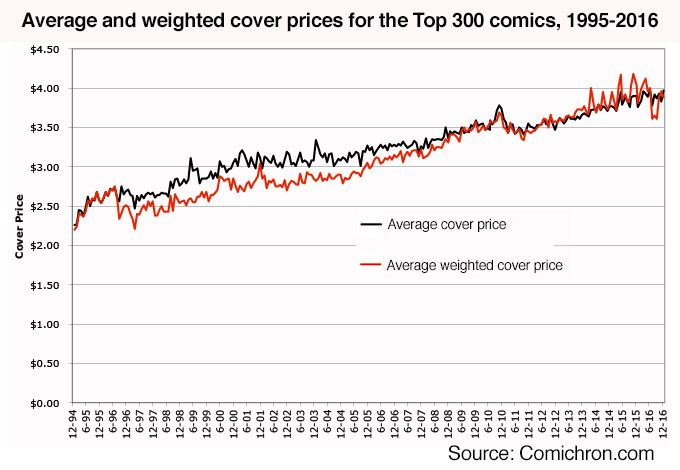 From 2012 to 2015, the trend was toward the most popular comics having premium or higher prices, pushing the weighted price ahead. DC turned that trend around in 2016, prompting us a month ago to take a look at what the year would have looked like with the DC Rebirth books priced at $3.99. The Beat reported yesterday that DC will be rolling selected titles back to $3.99 in 2017, along with digital redemption codes included, so the return to the previous pattern may be a brief one, with the average comic book retailers order costing more than the average book offered. But what's probably more noteworthy is how the two figures have progressed more or less in lock-step in recent years; 2015's 13-cent gap was the largest since 2006. 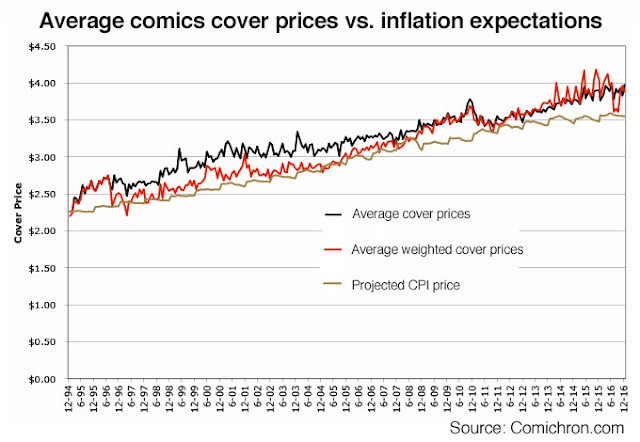 We can see above that if we were to track from 1994's prices using the inflation rate, comics prices have tended to outpace those rates — not surprising, since comics pricing is tied to paper costs and other costs of production that increase at different rates. There have been times in which prices have increased faster than others: particularly 2008-2010, when major publishers tried to go from $2.99 to $3.99 in defiance of the general recession the rest of the economy was suffering. Comics publishers pulled back on price increases at that point. But generally, we might expect that a $2.25 comic book in 1994 ought to cost about $3.55 twenty-two years later, in 2016. We're only about forty cents above that figure. You can find these charts at their permanent home on our monthly pricing page. John Jackson Miller has tracked the comics industry for more than 20 years, including a decade editing the industry's retail trade magazine; he is the author of several guides to comics, as well as more than a hundred comic books for various franchises. He is the author of several novels including Star Wars: Kenobi, Overdraft: The Orion Offensive, and Star Wars: A New Dawn, now available in paperback. All three volumes of his novel trilogy for 2016, Star Trek: Prey, are now on sale.